Want a family day out from Edinburgh? Blue Flag beaches, historic castles and top quality shopping centres are all just a short train ride away. There are excellent rail links from Edinburgh to the rest of Scotland and Northern England. Many tourist attractions can be reached by train. Perth stands on the banks of the River Tay. For centuries, it has been a vital link between the major cities of southern Scotland and the rural north. This unique position has created a wealth of history and attractions include St John’s Kirk, Scone Palace and Elcho Castle. The modern city centre is a thriving mix of shops and restaurants, together with relaxing parks and gardens. Trains to Perth run every hour from Edinburgh; the journey takes 1 hour 20 minutes. Trains to Aberdour and Burntisland run every 30 minutes from Edinburgh; the journey takes 30 minutes to Aberdour and 35 minutes to Burntisland. Deep Sea World has one of Europe’s largest collections of sharks, in the longest underwater tunnel in Britain. Other exhibits include piranhas and seals, and visitors can touch live exhibits in rock pools. Deep Sea World is at North Queensferry, just across the Firth of Forth from Edinburgh and is a short walk from North Queensferry station. Trains to North Queensferry run every 15 minutes from Edinburgh; the journey takes 20 minutes. 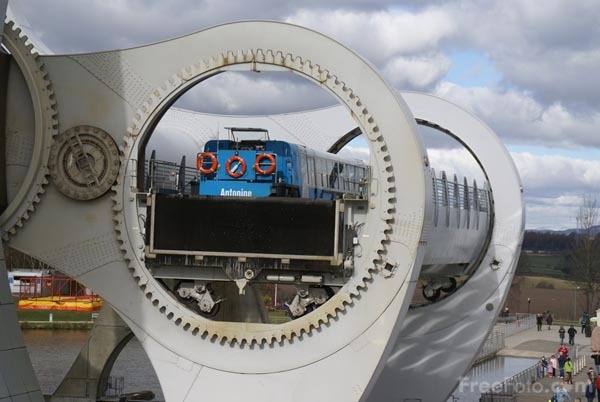 Take a ride on The Falkirk Wheel, the only rotating boat lift of its kind in the world, connecting the Forth and Clyde Canal with the Union Canal. A 50 minute boat trip is the best way to see the wheel in action. The wheel raises boats by 24 metres but the Union Canal is still 11 metres higher than the aqueduct which meets the wheel. Boats must also pass through a pair of locks between the top of the wheel and the Union Canal. There are regular trains to Falkirk High and Falkirk Grahamston. The journey time is 30 minutes. The wheel is just over two miles fromthe stations and the No 3 bus runs every15 minutes from near both stations. National Rail provides up to date details of train times and fares. Posted on July 22, 2015, in scotland and tagged Edinburgh, Falkirk, Perth. Bookmark the permalink. 1 Comment. Reblogged this on Northern Biz WordPress Blog. All text is copyright John Oyston. Images are the copyright of the attributed photographer.